Horse with a skin condition caused by allergies. With much of North America having a mild winter, spring has come early. Along with warmer temperatures and sunny weather, come allergies for many horses. Spring allergies tend to strike horses in one of two ways. One way is skin allergies. With any allergy, a horse becomes sensitized to the offender - usually a protein of some sort. While initial contact may not cause any obvious problem, repeated exposures lead to reactions that can be most easily described as "over-reaction" by the immune system with release of histamines. Horses with skin allergies will itch, bite, rub, and roll to relieve the irritated area. 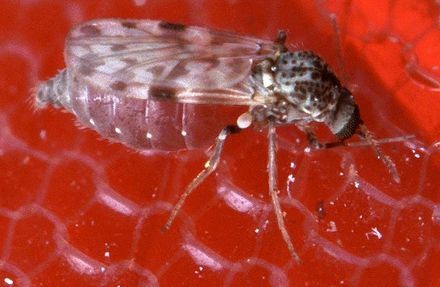 The Culicoides species of biting midges are first on the list of irritating insects. The most common cause of skin allergies in horses in the spring is insect bites. The Culicoides species of biting midges, or "no seeums," are first on the list of irritating insects, but horses can be allergic to virtually any biting insect. Insect saliva sets off an immune reaction and your horse may develop hives or weeping sores, especially on the midline of his stomach. Rubbing and rolling irritate the areas even more. You may hear the terms "summer itch," "sweet itch," or "Queensland itch" used to refer to allergic reaction to Culicoides species' saliva. This is not just an Australian phenomenon, but can occur in horses in almost any geographic area. Parts of the body most affected tend to be around the mane, tail, and the top of the back. 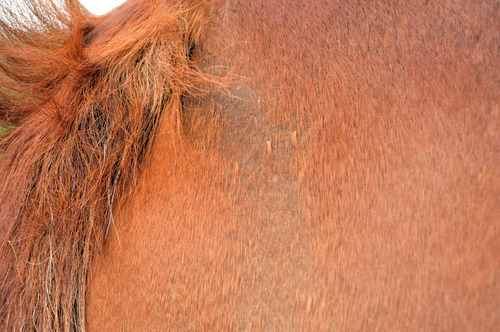 Some horses also show signs of pruritus near the head and ears. Carla Sommardahl, DVM PhD, Associate Professor in the Large Animal Clinic at the University of Tennessee, says dealing with fly allergies can be frustrating for horse owners. Certainly you do the best you can to keep insects off your horse. Using fly masks and fly sheets, including the ones with impregnated insecticides, may help. It is difficult to find fly sprays that consistently repel insects. Insect saliva sets off immune reactions in horses. Parts of the body most affected tend to be around the mane, tail, and the top of the back. Horses can be managed to avoid fly bites to some extent. Change the time of day when your horse goes out. If Culicoides species in your area are active at night, your horse should go out during the day, and vice versa. When your horse is inside, try to have good ventilation - even a fan blowing on his stall - to minimize insect activity. 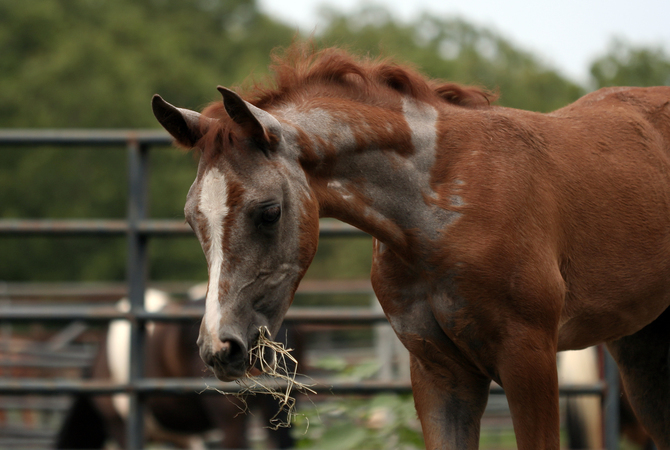 A horse with severe skin allergies may need medical treatment at times of peak irritation. These medications may include antihistamines and systemic steroids for short periods of time. Topical ointments or medicated shampoos may help mild cases. The other group of spring allergies are inhaled or respiratory allergies. Generally, these allergies are reactions to various plants, molds, and pollens. By tracking your horse's signs carefully, you may be able to isolate which pollens are the biggest problem. Of course, short of moving, your horse will still be exposed to local pollens every spring. Skin testing and blood testing to determine allergens can be used to develop desensitization injections for some horses. How can you handle pollen allergies? There are some management techniques that may help to keep your horse comfortable. Dr. Sommardahl suggests, "Keep your horse inside on hot and humid days, ideally with a fan or good ventilation. The heat and humidity simply add to his discomfort. Watch the pollen counts that your local weather newscasts provide. On bad days, your horse stays in, though he might be able to go out at night." Keeping pastures mowed or bush hogged to prevent plants from pollinating can also help a bit. Try to minimize dust around your barn to prevent further irritation of your horse's respiratory tract. Skin testing and blood testing to determine allergens can be used to develop desensitization injections for some horses. Most horses require a custom mix of allergens. It may take a year or so for you to see true benefit, but many horses respond at least somewhat. Luckily, many horses also respond well to inhalant medications, such as albuterol, for respiratory signs. Inhalers can be used directly into the nose or with special face masks. Some horses need occasional treatment with inhaled steroids, as well. If possible, your veterinarian will try to avoid systemic steroids due to long term side effects.